From Wexford, Susannagh Grogan began her lifelong love of print when she studied at Wimbledon College of Art and then specialised in Printed Textile Design at Chelsea College of Art & Design in London. Before setting up her fashion label, she developed her skills as a print designer by travelling & designing in New York, London & Cape Town. Susannagh has designed for a variety of clients that include Victoria’s Secret, Macy’s, Tommy Hilfiger, Estée Lauder, Mint Velvet & Anthropologie. While freelancing for the leading design studios in London and New York, Susannagh’s print design have sold throughout the UK, Europe, America and Japan. Her passion and expertise for print design and colour has led to her designs appearing in well known brand collections as well as in specific design commissions. Multi award winning designer Susannagh Grogan showcases 20 years international experience and passion for print with her luxury fashion label. 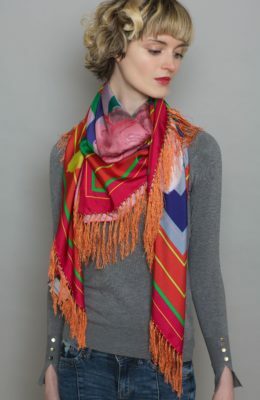 Her label was launched in 2009 with her signature printed silk scarves. 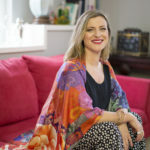 This, Susannagh’s first eponymous collection, a small range of colourful and floral prints with inspirational and humorous quotes, sold out in weeks and Susannagh Grogan Scarves was born. 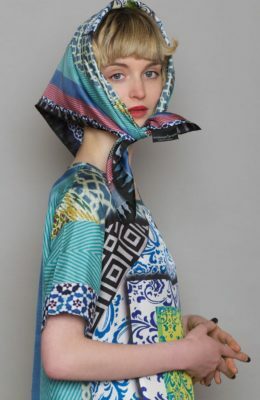 The artworks for all collections, which has expanded to now include fabulous printed leather, clothes and men’s ties, continues to be designed and overseen from start to finish by Susannagh, She uses a variety of print design techniques, merging traditional and modern. Finally, Susannagh partners with a small family-run print business in Como, Italy to ensure the perfect combination of excellent print design and exquisite printing for her designs. Susannagh Grogan scarves were chosen by the US-Irish Alliance pre-Oscar party as gifts for guests that included Michelle Williams and Melissa McCarthy. For St Patricks Day at the White House, Ireland’s Attorney General, Máire Whelan gave a Susannagh Grogan printed silk scarf to Associate Justice of the Supreme Court USA, Ruth Bader Ginsburg. Anthropologie USA has commissioned Susannagh to produce scarves for their store since 2013.